Back in August when Google announced their new video messaging platform, Google Duo, MeetingPlay quickly took the opportunity to share what Google Duo meant for event professionals - and what Google Duo meant for the world of live streaming at events. With yesterday’s official launch of the secondary component of Google Duo – Google Allo, a ‘smarter messaging app’ – we wanted to explain what Google Allo means for event professionals. One of the beloved features of iPhone’s iMessaging platform, was the awareness of knowing when someone was responding to you. When someone was writing a text to you, a ‘….’ would appear while they were typing. However, this feature only worked when communicating with others using iMessage, meaning text messages from android users and windows phone users were still a mystery. While both parties must have the new Google Allo message installed, message transparency has picked up at the speed force. In addition to the awareness that someone has received your text message, the new Google Allo will allow begin to learn event professional’s behaviors and responses. I.E. in one of Google Allo’s examples, they reference how’s the new place – and Google Allo is able to instantaneously view through the recipient’s photos and respond without the end users having to engage within the text. For event professionals this means real time updates could be sent systematically, even if one event professional is not currently engaging within the app or available for immediate response. What this means for event professionals? If Event Professional #2 has just set up a kiosk registration display and snaps a photo, and Event Professional #1 10 minutes later asks how set up is going, theoretically Event Professional #2’s Google Allo will be smart enough to respond with a photo of the kiosk registration display, without Event Professional #2 even having to look at his or her phone. 3. 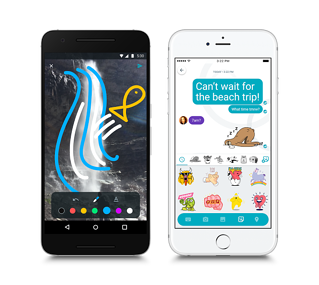 Google Allo Meets iOS 10? Some of these ‘similar features’ between Google Allo and iOS 10 messaging include ‘marking up’ photos before sending, and installing and sending larger emoji. While sending 'ZzZzzz’ cookie monster emoji may not necessarily be a direct benefit for most event professionals, marking up photos directly within both Google Allo and iOS10 without having to ‘edit’ the photo first in an external app, could come quite in handy. Other cool features that may be beneficial for event professionals within Google Allo include making plans with a fellow user and connecting both to your calendar (similar to an older iMessage feature), being able to ask @google within your text message so both users can see the same Google answer, and being able to chat in incognito mode. If your event has multiple players, not all of whom utilize the same device, Google Allo might be a great solution that provides easy and intuitive messaging that you currently aren’t receiving in your mobile to mobile communications. Yet, as far as your event attendees go – one of the great things about MeetingPlay’s mobile event apps, is the ability of cross device functionality. All user experiences within the app, and information, are collected in our secure cloud, which means the information goes with the user, not with the device – providing a truly seamless, interactive, and engaging mobile event app experience.